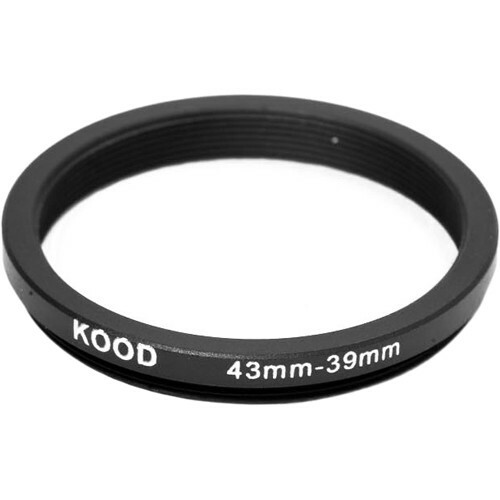 Extend the use of your dedicated lens filters with this 43-39mm Step-Down Ring from Kood, which permits the use of your 39mm threaded filters on lenses with 43mm filter threads. It features a lightweight, aluminum-alloy construction that has a corrosion-resistant, black anodized finish for durability and to minimize reflections. Box Dimensions (LxWxH) 3.0 x 2.0 x 0.01"
43-39mm Step-Down Ring is rated 4.5 out of 5 by 2. Rated 4 out of 5 by Vincent from Use is as a retaining ring for Copal #1 shutter It fits the thread of a #1 shutter.